Earlier this week we released Poster #11 by David Lester, which focuses on the life of anarchist Emma Goldman. In particular, Lester discusses Goldman’s activism in Toronto towards the end of her life. Emma Goldman was born in 1869 to a Jewish family in Kaunas, Lithuania. Fleeing the pogroms of Europe, she immigrated to the United States in 1885 and committed herself to anarchism. She was deported in 1919 for her anti-war activities, and then after years of exile in Europe, Goldman came to Canada in 1939. Goldman had lived in Canada twice before, and she had toured the country on numerous occasions. She used her extraordinary oratory skills to help develop an active anarchist movement. Her lectures on various subjects inspired large enthusiastic crowds across Canada. During the final year of her life, she struggled with the melancholy of not seeing her “beautiful ideal” realized. Despite thinking Toronto “deadly dull,” she remained undaunted. Goldman encouraged local anarchists to organize, and they formed the Libertarian Group. They held anti-fascist demonstrations, supported refugees of the Spanish Civil War, and held weekly political discussions. When Canada entered World War Two, five members of the Libertarian Group were arrested and charged with violating the War Measures Act (for possession of printed anti-war materials). Goldman, now 69, leapt into action, taking charge of fundraising and organizing their defense. For Goldman, the case was a question of freedom of speech and civil liberties that affected all Canadians. The accused were found innocent, but two of the men faced deportation, including Italian-born Arthur Bortolotti. If deported back to Italy, Bortolotti faced certain death at the hands of Benito Mussolini’s fascist state. Goldman solicited support from activists around the world. In Winnipeg, she held public meetings organized by the Arbeiter Ring and the Industrial Workers of the World. She also met with the leader of the Co-operative Commonwealth Federation, J.S. Woodsworth, who promised to take up Bortolotti’s case with the federal government. The RCMP kept tabs on Goldman’s every move: “RCMP AGENT 302: The Workman’s Circle have a number of well-to-do Jews, who provided the funds for EMMA GOLDMAN to visit Winnipeg.” Bortolotti was ordered to be deported, but Emma’s relentless campaigning eventually led Prime Minister Mackenzie King to stop the order. In the winter of 1940, Goldman had a stroke that paralyzed the right side of her body and left her unable to speak. She died in her apartment on Vaughn Road in Toronto on 14 May 1940. A memorial service was held at the Labour Lyceum on Spadina Avenue, with the crowd so large that it spilled out onto the street. The long history of social protest in Canada is often left out of official history. Emma Goldman is part of that radical tradition. I read her autobiography when I was a teenager, and I later joined the Vancouver-based anti-authoritarian news journal Open Road (1976–1990), which was the original name of Goldman’s magazine Mother Earth. I created a poster of Goldman for Open Road that was distributed around the world. Forty years later, I’ve created this second poster. Such is the power of history, of remembering, of understanding. 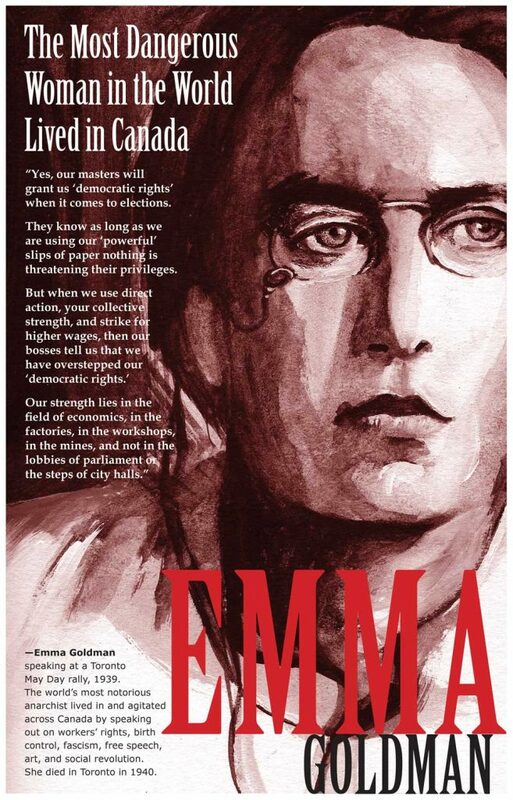 Emma Goldman’s courageous actions will continue to challenge us and inspire our own fights for social justice in Canada and around the world. David Lester is the guitarist in the underground rock duo Mecca Normal. His poster of anti-war protester Malachi Ritscher was included in the 2014 Whitney Biennial (NYC). He is author/illustrator of The Gruesome Acts of Capitalism and the graphic novel The Listener. He is at work on a graphic biography of Emma Goldman. Griffin, Frederick. “Emma Goldman, Toronto’s anarchist guest.” Toronto Star Weekly, December 31, 1926. Marshall, Peter. Demanding the Impossible: A History of Anarchism. London: HarperCollins, 1992. Moritz, Theresa, and Albert Moritz. The World’s Most Dangerous Woman: A New Biography of Emma Goldman. Vancouver, BC: Subway Books, 2001.